Marguerite Bennett’s 17 issue run writing everyone’s favorite deal-making, ginger, lesbian angel bounty hunter and her hilarious, multi-instrumentalist, trans woman lover comes to a close in Angela Queen of Hel #7, which ties up the love story of Angela and Sera as well as the story arc of Leah, who begin as a literal “hand” maiden of Hela and now has her own life and adventures with more just waiting to be told by another enterprising creative team. 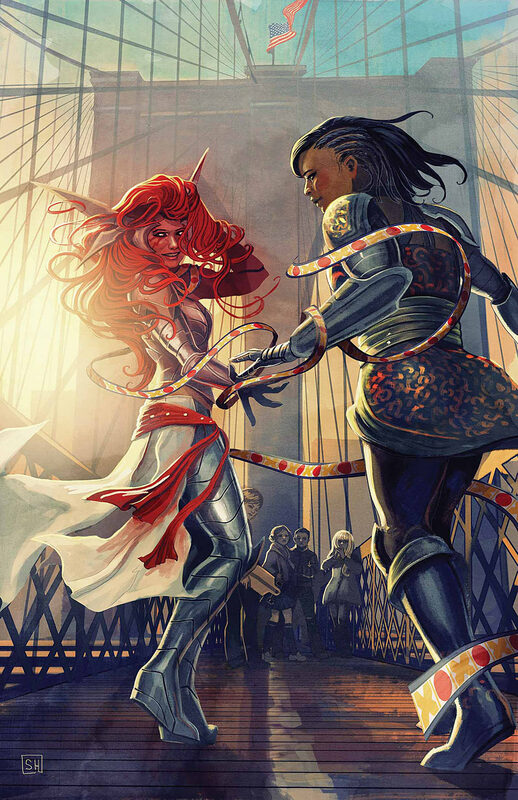 Bennett and artist Kim Jacinto also tie up some loose ends from the 1602 Angela Witch Hunter series with the Angela from that comic showing up as Faustia, the ultimate deal maker. Also, there are pages upon pages of gorgeous Stephanie Hans art telling the story of Leah and also hinting at possible future story arcs if the comic wasn’t unfortunately cancelled. The nine page Hans drawn montage in the middle of the comic depicts the seven years that Leah, Angela, and Sera are all together while Leah sets up Faustia’s release from the Faerie Curse and most of all, her reunion with Serah. If I recall correctly, this is the first time in a Big Two comic that a same gender couple has been depicted with an adopted child even if the circumstance for Leah being Angela and Sera’s daughter are quite “fantastical”. Angela‘s depiction of a loving queer relationship will definitely be missed in years to come, but Bennett gets in some last quips and sweet nothings while Hans gets to draw everything from Loki and Leah facing off in a kind of reunion to another fun team up with the Guardians of the Galaxy and even a restructuring of Heven’s caste system, which is pretty complicated and definitely needed at least an issue to But equality is cool, and Bennett and Hans show the almost limitless storytelling potential of the world that they, Kieron Gillen, and other artists have created over the past couple years for Angela and Sera. In her art style, Hans is a rare talent that can find the happy medium between cartooning and painted style art while also coloring her own work in an evocative manner. Even though Angela and Sera are the main characters in Angela Queen of Hel, Leah is the star of Bennett and Hans’ sub-story. Hans gives her a great range of expressions from sad and listless to cheerful when she gets a big lick from her Hellhound Thori and super serious when Angela, Sera, and the Guardians of the Galaxy. She can do adorable too like when Sera gets the present of a flute from Angela so she can play more than “Scarborough Fair”. Honestly, a family sitcom starring Angela, Sera, and Leah would make an excellent comic, and luckily the past few issues have given readers a glimpse at their “domestic” life. But when she isn’t drawing them having ramen or talking about Leah’s day at school, Hans makes their lives downright epic through mood capturing colors, like splashes of paint for Sera’s bard attack on a dragon near L.A., faded cream colors when Leah feels sad, and a scarlet red gold when Heven decides to invade that in a happy alternative universe would be a linewide crossover. Israel Silva uses a similar palette in his work with dark reds when Faustia threatens Angela, Sera, Thor, and Leah to a softer hue of red when all of the Angelas and Seras find their happy ending. Throughout its run, Angela Queen of Hel has actually been one of Marvel’s funniest books between all the Shakespearean drama of Hel, Heven, and the places in between. (No one likes to spell things correctly in this book.) There’s everything from witty barbs to references both highbrow and what white dudes in ivory towers would call lowbrow as well as some timely fourth wall breaking and even good old fashioned slapstick. The characters bounce off each other really well and even the guest stars have an easy rapport, like Sera inviting Star-Lord to sing “Bring Me to Life” by Evanescence during their next excursion to a karaoke singing planet. (Who knew this lover of 70s pop hits had a mall Goth side?) And Leah has her dry wit intact from Kieron Gillen’s run on Journey into Mystery as the literally eternal sulking teenager. Angela Queen of Hel is stealthily Marvel’s finest contribution to the romantic comedy genre, especially with the way Jacinto draws the final pages with Angela and Sera with plenty of close-ups of them holding hands concluding in a final page spread of the Brooklyn Bridge at twilight as Bennett ties together Angela’s main theme of making deals and bargains in an apt final line of dialogue. Angela Queen of Hel #7 gives Angela and Sera the beautiful and well-earned happy ending that Marguerite Bennett has been building up during her entire run on the title. She and artists Kim Jacinto and Stephanie Hans also round off Leah’s character nicely, especially in the sub story, which acts as a glimpse of possible storylines if the Angela Queen of Hel will be missed not only for having Marvel’s best example of a same gender relationship and LGBT representation, but also for being one of its funniest and gravitas filled books.